Just writing the names of the dishes we made at the raw vegan “cook-up” today makes me hungry all over again. It was a delicious meal. I knew I would have to do all the shopping in a big rush, so I intentionally planned something easy. Or relatively easy. I didn’t get too many pictures, but I think some of the others took some, so hopefully I’ll be able to add more later. We also had a journalist along at the cook-up, so watch this space for info on an upcoming article on raw foods. Seems interest in raw food is growing in Joburg. Little by little. Strain the tamarind pulp to remove seeds or any hard, fibrous bits. Put the tamarind paste and water, along with all other ingredients, into the blender and blend until smooth. Instructions: Place a nori sheet shiny side down on the sushi mat. 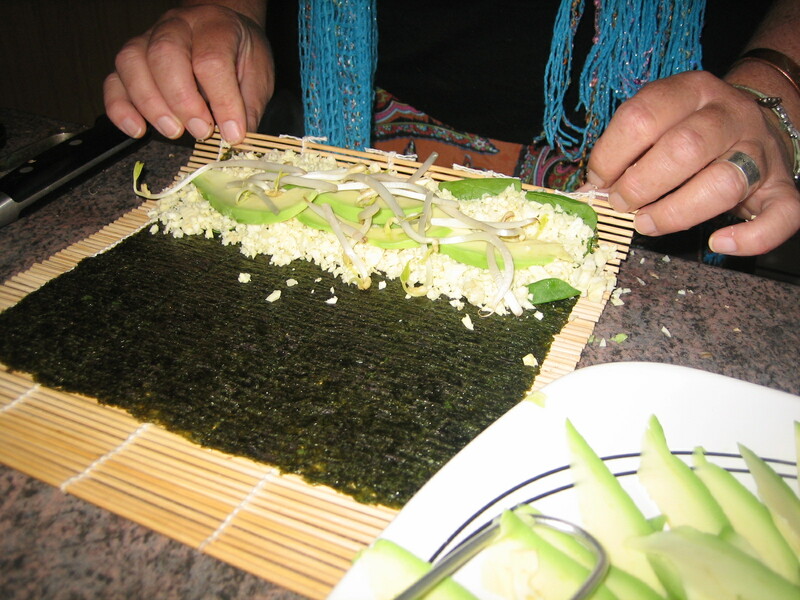 Place a few pieces of baby spinach along the edge of nori closest to you. 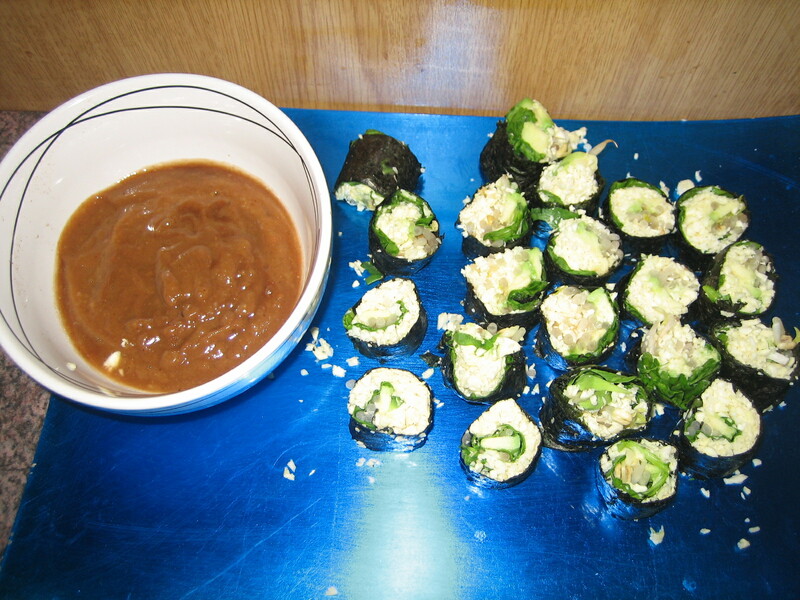 The spinach acts as a buffer between the “rice” and the nori to prevent it getting soggy. Put some parsnip rice on top of the spinach. Top that with avocado and mung bean sprouts (or any other toppings you might feel like). Roll up the sushi, sealing the edge of the nori with water. Repeat with as many sheets of nori as you want. To cut the sushi, use the sharpest knife you have, and keep wetting it with cold water in between cutting. Dip in tamarind sauce and enjoy! Instructions: Pulse all ingredients in food processor until parsnips have a rice-like consistency. Instructions: Place all ingredients in blender and blend until smooth. Instructions: Mix all ingredients up to cashews together. Squeeze lime juice over the salad. If you want you can also add a little bit of sesame oil. Spoon the salad over the lettuce (using the lettuce as a dish). Drizzle mango sauce on top. 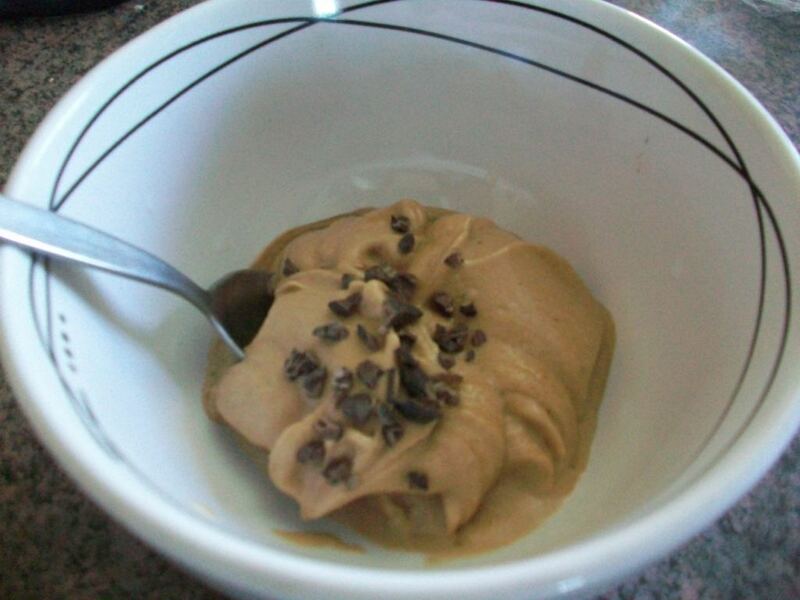 Instructions: Place ingredients in blender or food processor and blend until creamy. Add water only as needed to allow for blending. Optional toppings: cacao nibs, ground walnuts, shredded coconut, fresh berries, cinnamon, etc. Raw chocolate ice cream with cacao nibs. Yum! Warning: This ice cream is so good, you’ll want more than 1 serving for sure. And the good news is, you can have as much as you want. It’s healthy! 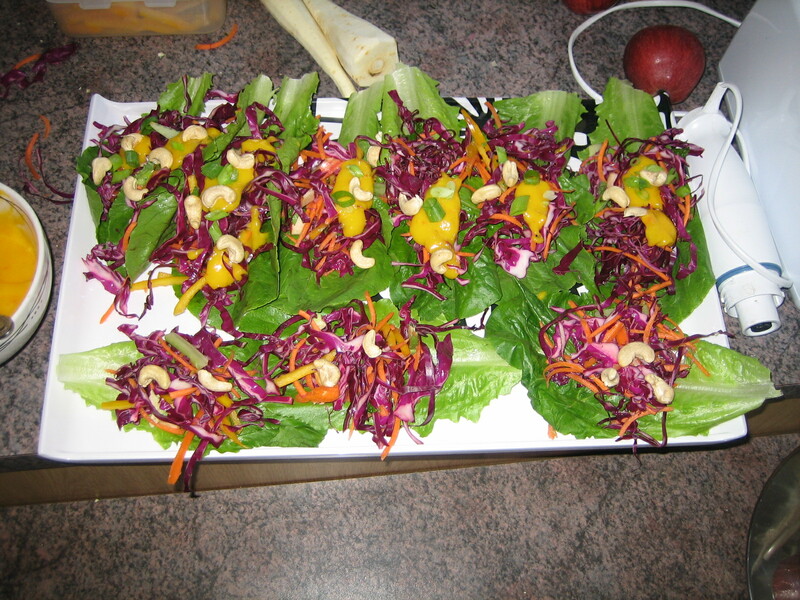 This entry was posted in cooking classes, desserts, main course, Raw Food, recipes, salads and tagged asian rainbow salad, cooking class, parsnip rice, raw food recipes, raw ice cream, raw vegan sushi, recipes. Bookmark the permalink. Yesterdays Raw Food Experience was amazing thank you so much. Both Michael and I thoroughly enjoyed ourselves and we can’t wait for the next one.